People often confuse Brittany Sears with Britney Spears. But Sears is no multimillionaire pop star. In fact, money is tight for Sears, a federal correctional officer in Safford, Ariz.
Brittany Sears with her son Jayden. Sears is a federal correctional officer in Safford, Ariz., who has been furloughed because of the partial government shutdown. Since the government shutdown began, Sears has kept the heat off at home, hoping to save $100 this month while she isn't getting paid. "If it gets to about like 50 degrees or something, it gets really cold in here. I'll turn it on and get it up to maybe like 60 or 65 and then I'll turn it off again," Sears, 30, explains. As the government shutdown enters its fourth week, she and other furloughed federal workers and government contractors are struggling to pay their bills. Grocery stores and restaurants are handing out free food. Unions are negotiating to get their members more time to pay utility bills. And banks and credit unions are waiving late fees or offering low- or no-interest loans to qualified borrowers. Sears is still working 10-hour shifts at the prison. When she's not, she's calling her mortgage and car lenders about deferring payments. She's also scouring the house for things she could sell — including a prized camper van she just paid off. Sears is a single mom raising a 6-year-old boy on her own. Since the shutdown began, she's switched to cheaper grocery stores and buying frozen, not fresh. She drives less and had to explain to her son why a $3 video game isn't in the budget: "Mommy doesn't have money right now. ... I'm not getting a paycheck," she says she told him. "And he's like, 'But you go to work, Mom. ... Well, when I get older I'm going to work and I'll help you.' "
The length of the shutdown — now the longest ever — is "uncharted territory" that could create a host of potential challenges for federal workers, says Ted Rossman, an industry analyst with CreditCards.com. For workers who missed bills this month, another 30-day delay in payment will mean their credit scores will be affected. But, Rossman says, "We're nowhere near that point yet. Hopefully, that gives people a little bit of comfort." To help bridge the gap, some credit unions are offering short term, no-interest or low-interest loans. Some banks are also offering to work with furloughed employees to waive late fees on mortgage or car loans — although most lenders are only offering a one-month reprieve. That's all a lot of work for Megan Fitzsimmons, who teaches GED classes at a federal prison in Elkton, Ohio. She has to manage her late payments in between her shifts. "You have your gas company, light company, car payment — all these things. And so I'm going to have to get the numbers, call these people, and, you know, try to put that off," she says. Fitzsimmons says she might have to put the bills on her credit card, to buy extra time. Congress passed a bill that would provide back pay once the shutdown ends. But in the meantime, she notes, there will be extra costs she'll never recover. "With a credit card they charge interest usually on the average daily balance, so even if we were to get paid toward the end of the month or something, I'm still going to be paying a bunch of interest on bills," Fitzsimmons says. Federal workers wait for food distribution to begin Saturday at a pop-up food bank in Rockville, Md. 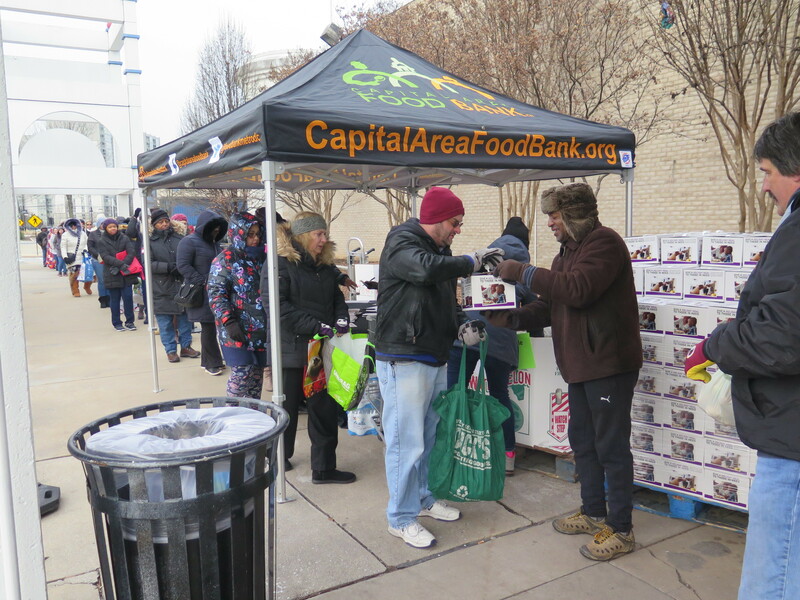 The Capital Area Food Bank is distributing free food to government employees during the shutdown. More fortunate workers like Michelle Arsenault, 53, of Alexandria, Va., can dip into savings. She hasn't been going to her job at the Department of Agriculture as an organic certification adviser since Dec. 21. She's spending her free time on inexpensive ventures like hiking and studying French. But she feels especially sorry for the many federal contractors she works with. "I think about the people that work in our cafeteria in our building who aren't getting paid and they're not going to get paid retroactively," she says. "They're just out three weeks' salary or however long this goes on." Arsenault has postponed a $1,000 gardening project and she isn't going out much. "I think about the ripple effect in the community, like me canceling work that I had to have done in the yard or I'm not eating out, I'm not downtown patronizing restaurants," she says. And that's playing out not only in the Washington, D.C., area, but all over the country. As the government shutdown enters its fourth week, furloughed federal workers and government contractors are struggling to pay bills. Grocery stores and restaurants are now handing out free food. And some employee unions are negotiating for more time for members to pay their utility bills, as NPR's Yuki Noguchi reports. YUKI NOGUCHI, BYLINE: Brittany Sears' name is often confused with Britney Spears. But Sears is no multimillionaire popstar. In fact, money is tight for Sears, who's a federal correctional officer in Safford, Ariz. At home, she bundles in warm clothes as she shuffles over to check her thermostat. BRITTANY SEARS: So right now it is at 60. NOGUCHI: It's snowed since the shutdown began, but Sears keeps the heat off, hoping to save a hundred dollars this month while she isn't getting paid. SEARS: If it gets to about, like, 50 degrees or something, it gets really cold in here, so I'll turn it on and get it up to maybe, like, 60 or 65, and then I'll turn it off again. NOGUCHI: In the background, there is a persistent beep of the low battery indicator on her smoke alarm. SEARS: I just haven't had the time to really think about something like that. NOGUCHI: She's still working 10-hour shifts at the prison. When she's not, she's calling her mortgage and car lenders about deferring payments. She's also scouring the house for things she could sell, including a prized camper van she just paid off. 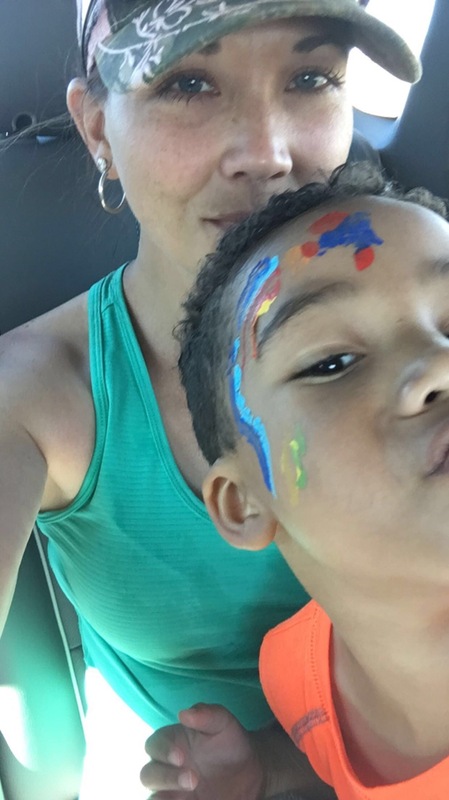 Sears is a single mom raising a 6-year-old boy on her own. Since the shutdown began, she's switched to cheaper grocery stores and buys frozen, not fresh. She drives less and explains to her son why a $3 video game isn't in the budget. SEARS: Mommy doesn't have money right now. You know, I can't get that right now. I'm not getting a paycheck. And he's like, but you go to work, Mom. And I'm just like, yeah, I know, baby, I go to work. And he's like, well, when I get older, I'm going to work, and I'll help you. NOGUCHI: Ted Rossman is an industry analyst with creditcards.com. He says with no end in sight, the current shutdown poses new kinds of challenges for workers. TED ROSSMAN: I think we're really in uncharted territory here. NOGUCHI: He says people who miss paying their bills this month will still have 30 days until their credit scores are affected. ROSSMAN: So we're nowhere near that point yet. Hopefully that gives people a little bit of comfort. NOGUCHI: Some credit unions, including Navy Federal, are offering short-term, no-interest or low-interest loans. Some banks are offering to work with furloughed employees to waive late fees on mortgages or car loans, although at present, most lenders are only offering a one-month reprieve. MEGAN FITZSIMMONS: Having to make all these calls - like, that's going to take a lot of time. NOGUCHI: Megan Fitzsimmons teaches GED classes at a federal prison in Elkton, Ohio. She's required to work, so managing her late bills is like having a job on top of that. FITZSIMMONS: You have your gas company, light company, car payment - all these things, you know? And so I'm going to have to get the numbers, call all these people and, you know, try to put that off. NOGUCHI: Fitzsimmons says she might have to put the bills on her credit card to buy extra time. Congress passed a bill that would provide backpay once the shutdown ends. But in the interim, she notes, there will be extra costs she'll never recover. FITZSIMMONS: With a credit card, like, they charge interest usually on the average daily balance. So even if we were to get paid, like, toward the end of the month or something, I'm still going to be paying a bunch of interest on bills. NOGUCHI: More fortunate workers like Michelle Arsenault can dip into savings. Arsenault hasn't been going to her job at the Department of Agriculture as an organic certification adviser since December 21. She's spending her free time on inexpensive ventures like hiking and studying French. But she says she feels especially sorry for the many federal contractors she works with. MICHELLE ARSENAULT: I think about the people that work in our cafeteria in our building who aren't getting paid. And they're not going to get paid retroactively. You know, they're just out three weeks' salary or however long this goes on. NOGUCHI: Arsenault postponed a $1,000 gardening project and isn't going out much. ARSENAULT: I think about the ripple effect in the community, like me canceling work that I had to have done in the yard, or I'm not eating out. I'm not downtown patronizing restaurants. NOGUCHI: And that is playing out not only in the Washington, D.C., area but all over the country. Yuki Noguchi, NPR News, Washington. Transcript provided by NPR, Copyright NPR.